Grulla shotguns and rifles might be a rare sight in the UK but now gunmaker William Evans has taken on the agency it is certain more sportsmen will come to appreciate these beautifully-crafted sporting arms. William Evans has been dealing with the small Spanish company ever since they brought examples of their work to the CLA Game Fair in 2009. Impressed by the quality, William Evans subsequently worked closely with Grulla to develop a new William Evans model, the Pall Mall, which was launched last year. Grulla shotguns and rifles are handcrafted in small numbers (around 200 annually) by a highly-experienced workforce at their workshops in Eibar, a small town in the Basque country. The region has a 500-year history of making arms, but while that may seem a lengthy provenance, it is nowhere near the almost 1,000-year family history behind Grulla customer Ralph Percy, 12th Duke of Northumberland. His ancestor, William de Percy, came to England with William the Conqueror in 1066. Two hundred and fifty-five years later, in 1309, Henry Lord Percy purchased Alnwick Castle in Northumberland, beginning an extraordinary relationship between the family and the town that has lasted for seven centuries. Having always loved the countryside, the Duke of Northumblerland eschewed a career in the City of London in favour of chartered surveying. He worked for various firms before taking a greater involvement in Northumberland Estates, the business wing of the title, and subsequently inherited the title in 1995 when his father died. Describing his role as essentially that of president of the family business, he is responsible for an organisation with more than 300 employees throughout the country. The estate is now a diversified business, encompassing a growing international property portfolio, over 100,000 acres of land centred on the north east of England, and a large residential property portfolio, together with fine arts and treasures, mineral rights, sporting and leisure interests. The wide-ranging responsibilities of property, land ownership and development require the employment of a considerable workforce, making the estate one of the larger employers in the north east of England. Tourism is very important to Northumberland, and many individuals and businesses relying on the income from visitors drawn to Alnwick castle and gardens. In addition to the conservation of buildings, conservation of the landscape also plays an important role on the estate, with around six and a half hectares of new woodland being planted each year in addition to the replacement of felled commercial woodland. In recognition of its achievements, the Duke of Northumberland recently received the prestigious Purdey Award for the ground-breaking work to improve conservation on his farms and dramatically increase numbers of wild English partridge. The project, which has encouraged tenant farmers, farm staff and keepers to work closely together, has brought significant benefits for many additional wildlife species. Acknowledging his good fortune at having been brought up in a shooting family, and being able to spend a great deal of time pursuing a sport that he loves, the Duke of Northumberland says that Alnwick Castle is a great place to call home. 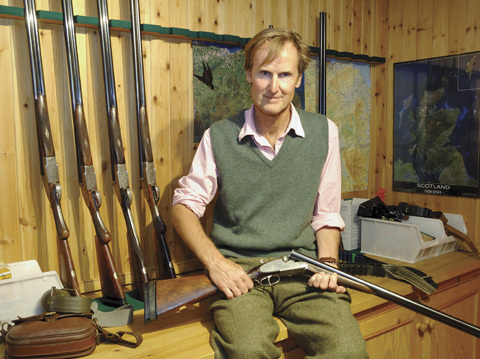 Ralph Percy, 12th Duke of Northumberland, pictured in the gunroom at Burncastle with a selection of the family’s Grulla shotguns. The Duke of Northumberland’s shooting year often starts on August 12 with a couple of days’ grouse shooting in north Yorkshire before moving to Burncastle, the 8,000 acre estate in the Scottish Borders where his family spend much of the summer. After the severe winter of 2009-10 took its toll on grouse numbers, little shooting took place there last year, but the previous year it produced 1,400 brace, with days of 100-150 brace between nine guns. “For some years we have let much of the shooting at Alnwick, with the smaller 50-100 bird days outside the park being managed by a sporting agency and largely taken by repeat bookings,” he explained. Having shot his first pheasant in 1966 at the age of 10 and his first grouse the following year, the Duke of Northumberland quickly progressed from using a .410 Robertson to the 20 bore Webley & Scott his father Hugh had shot as a child. At the age of 15, he adopted one of the family’s other guns, a 12 bore Holland & Holland Paradox, then three years later inherited a pair of Purdey 12 bores made in 1922. After a few years of service, however, these heirlooms were showing signs of age and becoming increasingly unreliable. Disillusioned by the high cost of repairs, he decided that he needed a pair of guns that were more durable and better suited to modern cartridges. It was while shooting in Spain with a friend that he first encountered Grulla shotguns. On a subsequent visit he met Jose Luis Usobiaga, managing director of Grulla Armas, and ordered a pair of Grulla shotguns. At that time Grulla had no representation in the UK, so the order was fulfilled directly from the factory. And he simply took the measurements from his existing Purdeys and specified the configuration he required. Having used them very successfully against a range of quarry over a number of years, the Duke of Northumberland passed the initial pair of Grulla shotguns on to his eldest son George, and ordered another pair better suited to shooting high pheasants. Whilst acknowledging that over-under shotguns are rapidly gaining popularity within game shooting circles, the Duke of Northumberland prefers the more traditional side-by-side barrel alignment and feels no compulsion to change. Having admired his Grulla shotguns, a number of his friends have placed orders of their own. 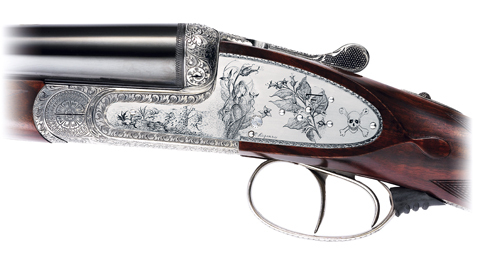 The engraving on the pair of Grulla Royal shotguns the Duke of Northumberland had made as a 25th wedding anniversary present for his wife feature the skull and crossbones motif. This patronage of Grulla continued with the purchase of a pair of 12 bores for his wife Jane, Duchess of Northumberland, who took up the sport early in their marriage to spend more time with her husband. The guns were a 25th wedding anniversary present for the Duchess, who had just finished her first book The Poison Diaries. To reflect its title the Duke of Northumberland had Grulla’s master engravers incorporate into the engraving various illustrations from the book, as well as the skull and crossbones that feature on the gates guarding the entrance to The Poison Garden, which forms part of The Alnwick Garden. In 2008 he purchased a further trio of second-hand Grulla shotguns as an 18th birthday present for his youngest son, Max.